I told my roommates I was leaning strongly toward getting a kitten. After some discussion, I said I would get anything female, and NOT a Siamese. So before the month was out, they gave me a male, AND a Siamese! After a few days without finding a name that fit him, I decided on Dawber, as DB and AW were the initials of my roommates. The name fit well. We all moved apart, lost touch, and reconnected almost twenty years later. I told AW that that cat was closer to me than any other living thing. He accepted and loved my husband, though it meant sharing my attention. When our child was born, Dawber would always be there for bedtime stories, and sit as guardian and companion with him until he fell asleep, only to join me afterwards for our own tea and cuddle time. Dawber was a Snowshoe Siamese, with four white feet; people always assumed his name was "Daub" as if he'd walked through white paint. Not only was his name fitting, but he was the perfect fit for me. 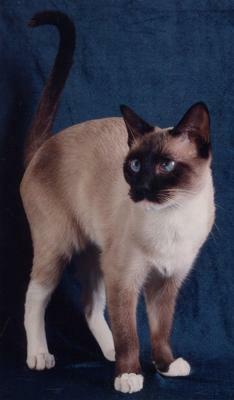 What a beautiful Snowshoe Siamese boy, Lianne! His feet were such perfect Snowshoe feet, with the two mittens and the front and the white stockings at the back. A gorgeous cat. I love the fact that your roommates gave you exactly the cat you didn't want, and that Dauber ended up being the perfect fit. I often feel that in some strange way our cats find us, rather than the other way round. And that once they love us, they love us unconditionally, and accept whatever comes into our lives with (on the whole) very little fuss. Thanks so much for sharing Dawber's picture, and the story of how he came by his name, with us - we don't get too many Snowshoe Siamese visitors and it's always nice to see some Siamese relatives! It is nice to hear such heart-warming tales of truly beautiful cats. Beauty beyond appearance, cats with beautiful souls. Return to Snowshoe Siamese Cats.